If you're a lover of captivating Spanish films as I am, then you may already know that the New York Spanish Film Festival is currently showing at the Film Society Lincoln Center. 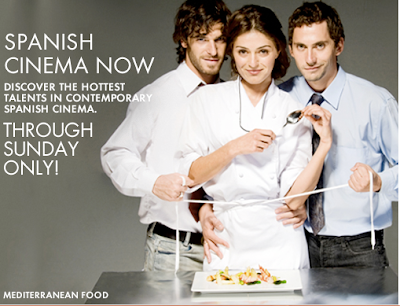 Last chance to experience one of these peliculas espanolas ((Spanish flicks) es este fin de semana (is this week). So if you have an appetite for some cinematic tapas and a longing for a Mediterranean movie platter, have a look at the schedule below to have your fill before it's too late! A country wealthy with cinematic treasures: Pedro Almodovar, Penelope Cruz, Javier Bardem. The series that helped introduce them to New York audiences...Spanish Cinema Now. For more information about the films in the series click on theRead more... link. To purchase single screening tickets online click on the SHOWTIME under Buy Tickets. Online service charge: $1.25 per ticket ordered. Passes and individual screening tickets subject to availability. Certain restrictions apply. The annual Shortmetraje program highlights the flourishing new talents in the short film genre coming out of Spain.